Christopher T. Magician Los Angeles kids older magic show - CHRISTOPHER T. MAGICIAN, INTERNATIONALLY KNOWN KIDS ENTERTAINER AND BIRTHDAY SPECIALIST. All those BOOGERS and TOILETS and FARTS ...OH MY!!! 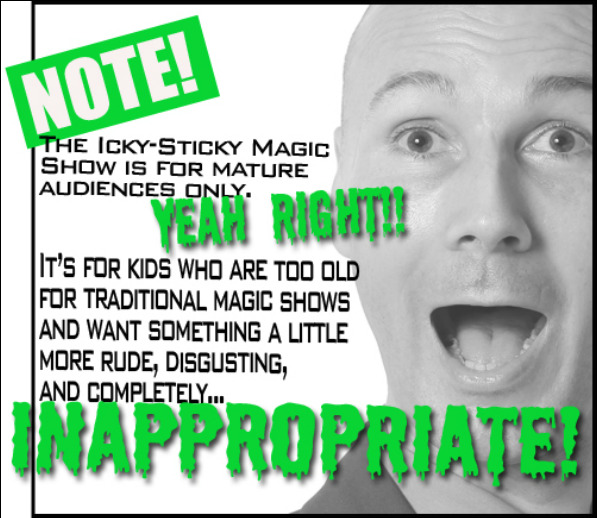 Put them all together with magic, and you've got one amazing gross-out show guaranteed to make your child's party an OVERFLOWING success! BUT YOUR KIDS WILL LOVE IT!! Plus Liza Minnelli The (adorable) Rat! Don't WASTE this chance and FLUSH it down the drain. Make this party NUMBER ONE for your child. WIPE away any possible boredom with THE ICKY-STICKY, GRIMEY-SLIMY, SNOTTY-POTTY, MUCKY-YUCKY, CREEPY-CRAWLY, GROSS AND SMELLY, LIZA MINNELLI MAGIC SHOW, everything will come out all right in the end! !